When Evolution Digital first came on the scene, the Centennial, Colo.-based company’s goal was simple: provide solutions for small- and medium-sized cable operators, to help them fight the loss of subscribers to satellite providers. And while the goal hasn’t changed, the company’s solutions — responding to an increasingly digital and fragmented world — sure have. The company that helped pioneer the development of non-CableCARD devices today has debuted the first IP hybrid set-top for the domestic market (integrating QAM, IP content and OTT services), and has launched its own integrated IP linear and VOD TV service. Brent Smith, president and CTO for Evolution Digital, spoke with the Media & Entertainment Services Alliance (MESA) about the evolving needs of today’s cable operators, the partnerships the company employs to meet its goals, and what the recent Federal Communications Commission’s (FCC) set-top proposal means for the industry at large. MESA: Evolution Digital came on the scene in 2008. In the near-decade since, how has the company’s offerings changed to reflect the increasingly digital needs of cable operators? Smith: In 2008, we really had a focus on providing tier two and tier three cable operators cost-effective solutions to stem the loss of subscribers and customers to satellite providers. We pioneered the certification of CAL security that enabled development of non-CableCARD devices. By using Evolution’s low-cost DTAs, operators were able to reclaim analog bandwidth and convert to digital distribution and high definition content. Now, eight years later, the industry has shifted again with the emergence of OTT services like Netflix and Hulu. Our innovative solutions today allow cable operators to become ‘aggregators of choice,’ combining live linear television with IP content, including OTT services, through one device and an integrated user interface. MESA: What steps has Evolution Digital taken to help operators address consumer needs for non-traditional linear TV, like IP VOD, OTT and TV Everywhere? Smith: We believe that the best viewing experience for the consumer does not leave out traditional live linear TV. There is content that still commands live viewing, such as sports and special events. That’s why Evolution Digital provides cable operators a solution to integrate live TV with IP VOD, network DVR, OTT and TV Everywhere services all through one user interface, one box delivered through the primary HDMI 1 input. This creates a compelling and simple experience for the consumer. This year we are deploying our first IP Hybrid Set-Top Box for the U.S. domestic market powered by TiVo, which can be configured to support an all-IP platform including live channels, video on demand and network DVR. The IP Hybrid Set-Top Box also features TiVo’s familiar user experience and includes OTT apps like Netflix, Hulu and YouTube. This year, we also launched eVUE-TV, an IP video solution that gives cable operators a wide library of IP VOD content across all devices in the home. eVUE-TV combines live linear services with IP VOD onto one platform for easy navigation and content discovery. 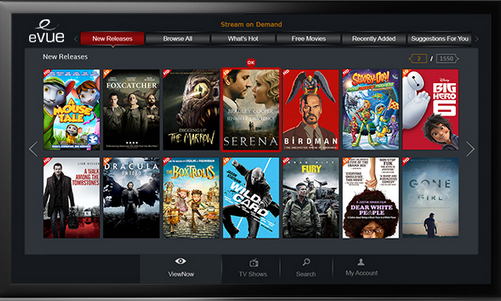 And with eVUE-TV’s offering of thousands of hours of new release and catalog movies plus popular VOD TV series, the cable operator has a tool to retain cord-cutters and reduce migration to other devices and OTT services like Netflix. MESA: TiVo, Vubiquity, Rovi … Evolution Digital partners with some of the media and entertainment industry’s biggest names. Can you briefly share how these partnerships advance the company’s solutions? Smith: We are proud to team up with the best-in-class technology partners to bring the most cutting-edge solutions to our cable customers. We challenge the status quo of the industry in many respects, and need partners that are equally willing and excited to do so. You’re right when you say that these are some of the industry’s biggest names; partnering with these household names provides consumers a reassurance of our quality of service and allows us to deliver solutions to the market much more quickly and cost-effectively than our competitors. MESA: On a more broad scale, what challenges do you see cable operators struggling with the most today, and what challenges do they need to be prepared for in the near future? Smith: Right now, although most small and medium-sized cable operators are familiar with the basic benefits of transitioning to IP, it’s not as easy as it seems. The IP shift can save money in the long term, but it can be costly in the short term. And with the rise in programming costs and pay-TV subscriber churn, cable operators are considering their options, such as deploying a hybrid set-top box, hybrid gateway or something else. Evolution Digital is committed to helping these smaller cable companies gracefully transition to IP video and have an end-to-end solution and technology roadmap that includes IP video, IP Hybrid set top boxes and in-home distribution using MoCA [Multimedia over Coax Alliance] technology. We recently reached a deal with the National Cable Television Cooperation to offers its members our IP Hybrid Set-Top Box powered by TiVo. This deal gives smaller cable operators in this group an affordable option for delivering our leading technology at a price point that makes sense for them, which eases the cost pains of migrating to IP. MESA: The FCC recently issued a proposal to unlock the set-top box market. What’s Evolution Digital’s stance on the proposal? Smith: Chairman [Tom] Wheeler has stated that the proposal does not employ the AllVid technology concept. However, in order to comply with the ruling, a smaller cable operator would need to either completely broadcast their current linear cable service in IP in order to support a common interface for third party devices, or add an additional device in the home to enable the conversion of the operator’s proprietary QAM video content into what’s called a “common” IP video stream that could interface with a third party device. Either of these options would be costly for tier 2 and tier 3 cable operators, causing price hikes for customers, which is the opposite of what chairman Wheeler has said this proposal would do for consumers at home. The plan for the industry, aside from this proposal, is for smaller cable operators to transition to IP video over time. The urgency put on cable companies by this FCC is an extreme burden, as they would be forced to quickly change, like a light switch, to all-IP in a timeline that isn’t realistic with current resources and capabilities. So we strongly support an exemption for tier 2 and 3 cable operators. MESA: What’s next for Evolution Digital, what services are in the pipeline and what industries/companies are in the company’s sights? Smith: As the leading provider of integrated IP solutions for the cable industry, both domestic and international, we plan on expanding our IP product lineup. The pay-TV industry is rapidly transitioning, and we want our clients to be prepared for what’s to come in the next two to five years. IP-based digital services are the future of television, with a skinny live offering and deep library of content for customers to choose from, including the potential of delivering 4K content. In fact, we are developing a 4K set top box for one of our Latin American customers right now. Our innovative and cost effective solutions will help cable operators remain relevant and stem the loss of subscribers to competing OTT services. We make it easy for cable operators to fully transition to IP delivery and offer the consumer the best available in-home viewing experience on any device.